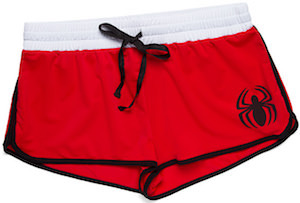 These women’s Spider-Man shorts are just what you need if you are a fan of spiders and Superhero’s. The women’s shorts are made from 90% nylon and 10% spandex and are red with black edges on the side and bottom and an elastic white waistband with a black drawstring. 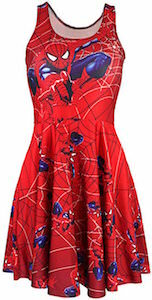 And Spider-Man symbol on the left hip makes these official Spider-Man gear. Spider-Man shorts like these are great for a summer run in the park or just lounging in the backyard or in front of the TV. And you can get these Spider-Man shorts in women’s sizes Small – 3XL so that you have the perfect fit for your new favorite summer shorts.